Bringing its inimitable blend of modern Italian all-day dining and shopping; Carluccio’s serves delicious, freshly prepared breakfasts, lunches, dinners and everything in between; the perfect excuse for a refreshing pit stop during your shopping. Carluccio’s unique food shop also offers beautifully-packaged, artisan products imported directly from Italy, alongside a deli featuring mouth-watering fresh produce including grab and go meals, cheeses, hams and olives. In addition, Carluccio’s has a large range of vegetarian and gluten free options available on the menu. 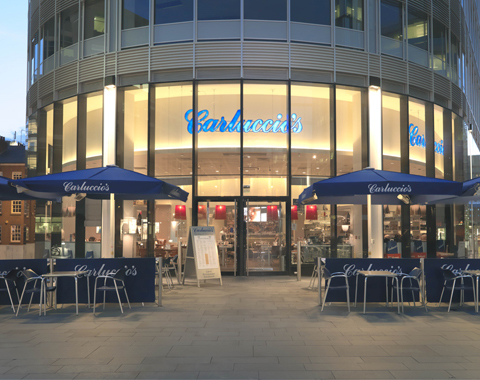 Open Monday – Sunday, Carluccio’s overlooks the green open spaces of Hardman Square and is conveniently located just a short walk from the Museum of Science and Industry, the People’s History Museum and the Manchester Opera House.